When Sayyed-e-na Khwaja Gharib Nawaz came to Ajmer Sharif foremost He sat under a peepul tree. This place was reserved for the camels of the Hindu raja, Prithvi Raj, of that place. The servants of the Raja came and started being rough on him and rudely said that your people are resting on the placement for the camels of the raja. Khwaja Sahib said, "fine we people will go, may your camels remain seated here." Hence the camels were made to sit over there. In the morning the camel-driver came and tried to make the camels stand up, but even after trying everything the camels did not stand up. They got scared and went to the grand presence of Hazrat Sayyed-e-na Khwaja Sahib and shamefully begged for forgiveness, for the rudeness. 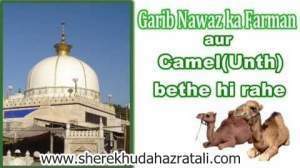 The uncrowned King of India Sayyed-e-na Khwaja Gharib Nawaz said, "Go by the order of Allah your camels have stood up." When they returned all the camels were, in fact, standing up. Camels Remained Sitting An Insane Miracle by Hazrat Khwaja Moinuddin Chishti Rehmatullah Alaih | Islamic Stories and Miracles..